A peristaltic pump often is a good choice for obtaining samples collected from wells at a depth of 28 ft. or less, but the stream of water from this or other suction-lift pump should not be used when measuring DO, Eh, or other properties sensitive to oxygen contamination or volatilization. The Geotech Peristaltic Pumps operate by mechanical peristalsis, so the sample only comes in contact with the tubing. This allows for sample integrity as well as easy cleaning and replacement. 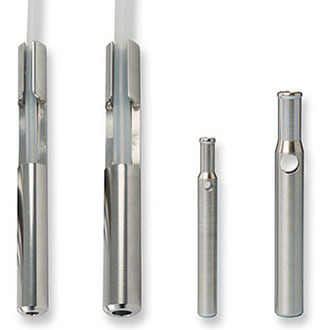 With the optional stainless steel tubing weight, tubing can be lowered to a specific depth without curling or floating on the surface of the water. 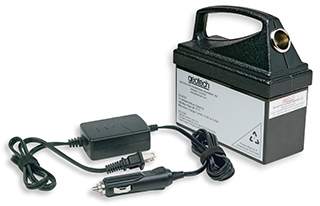 Geopumps operate from any external 12V DC or 120V AC power source. 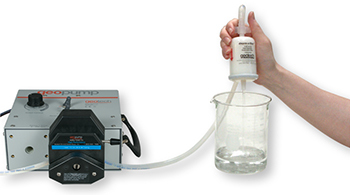 SERIES I Geopump™ Peristaltic Pumps are available in AC only, DC only, or AC/DC combination. These units have one pumping station which can be piggy-backed for multi-station pumping. They have variable speeds ranging from 60 RPM to 350 RPM. 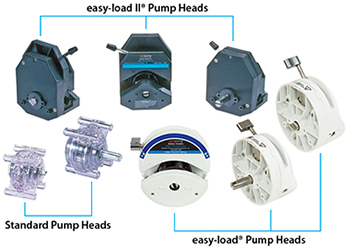 SERIES II Geopump™ Peristaltic Pumps are available in AC only, DC only, or AC/DC combination. They have two pumping stations which can also be piggy-backed for multi-station pumping. The first pumping station has a variable speed of 30 to 300 RPM and the second station 60 to 600 RPM. 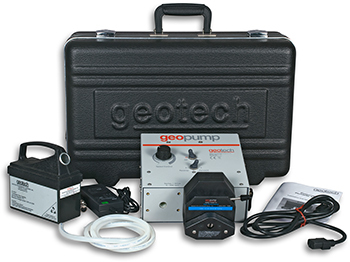 Geopump™ Peristaltic Pump Series II Kit with optional easy-load II® pump head, modular battery, 5 ft. (1.5 m) tubing, carrying case and power cord.